When the weekend comes around again, spend a little time preparing a delicious breakfast or brunch- after all, you’ve earned it following a busy week! 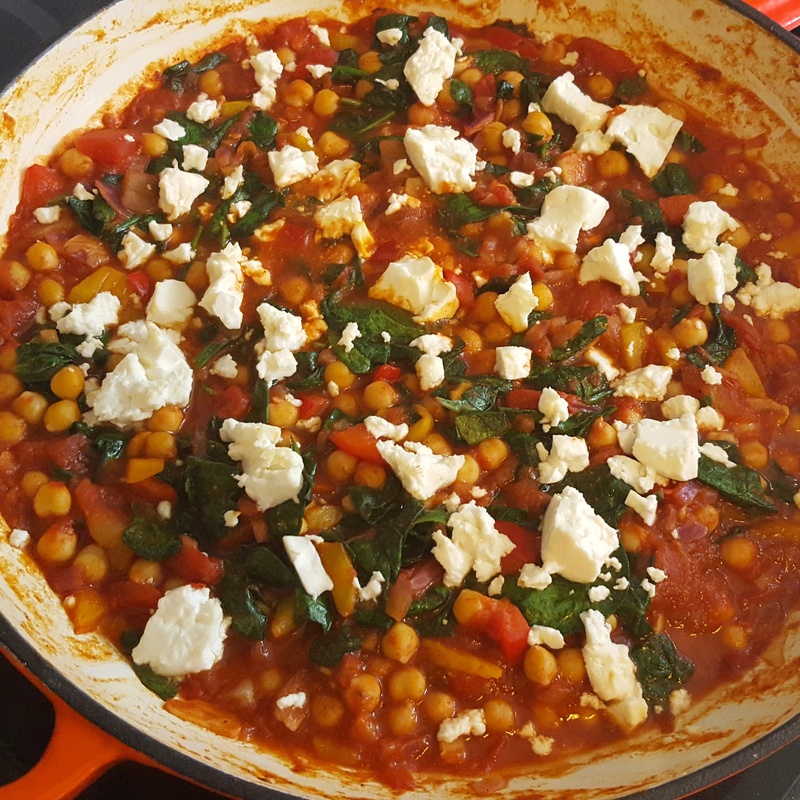 This spicy chickpea dish was inspired by the flavours of the Middle East to give a hearty and satisfying start to the day but would also be perfect for a dinner. If you have any leftovers, these can be kept in a sealed container in the fridge for a couple of days and can be enjoyed at lunch the next day. 1. Kick off by heating the oven to 200c/ 180 fan. Take a large frying pan, or similar, and heat the oil over a medium heat. Cook the onion, garlic and pepper together until softening nicely. Add in the ground cumin and coriander as well as the harissa. 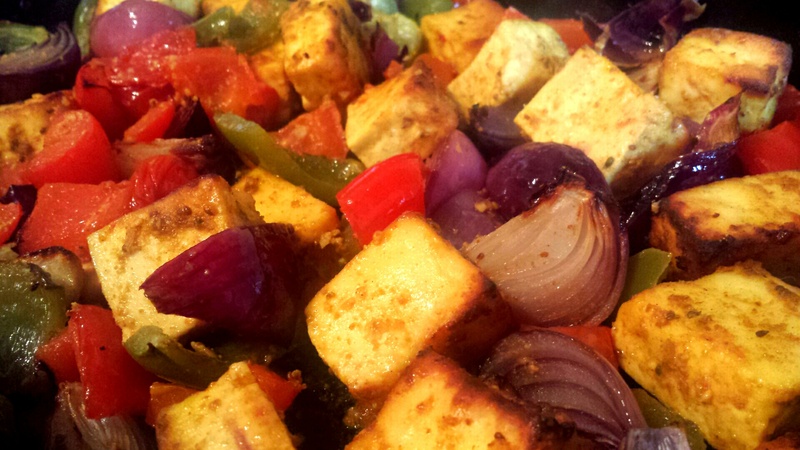 Stir well so the spices and harissa coat the onion mixture; cook for a further minute. 2. Add the drained chickpeas to the pan and combine well. In next goes the tinned tomatoes. Simmer the chickpeas for a few minutes until the sauce is starting to reduce and thicken slightly before adding the spinach. Cook until it wilts in the sauce and can be evenly distributed throughout it. Crumble over the feta and a sprinkling of chilli flakes if you want a but more spice and pop in the oven. Leave it until the feta warms through and starts to melt a little. Serve with crusty fresh bread and dive in! Middle Eastern inspired chickpeas- spice up your day! 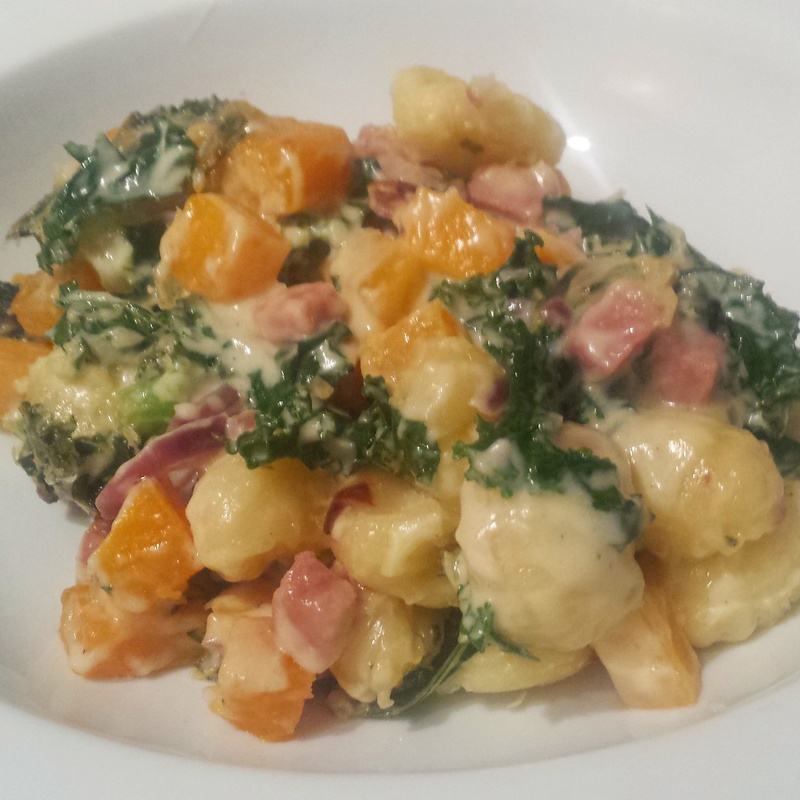 Kale, butternut squash and pancetta gnocchi combines many of my favourite ingredients in a light yet rich sauce to welcome in autumn in the coming weeks. Food should be colourful and vibrant and it certainly is! I have used a simple white sauce base with a touch of parmesan, garlic and red onion to lift and enhance the flavours of the vegetables but it would also be delicious with a mascarpone sauce if you prefer. Gnocchi is easy to buy and quick to cook and, as I baked it, I didn’t need to boil it before cooking so it’s even quicker! 1. Get started by preheating the oven to 180c/ 160 fan; you don’t want the oven too high so the vegetables and gnocchi don’t catch and burn. Take a large frying pan and add a glug of oil over a medium heat. Fry off the pancetta cubes until turning slightly golden, remove from the pan and set aside. Use the frying pan again and cook the onion and garlic for a couple of minutes until beginning to soften before adding the diced butternut squash. I fried the onion and garlic in the pan with the remaining pancetta juices for extra flavour. Turn the heat down to low/ medium and cook for a further few minutes. 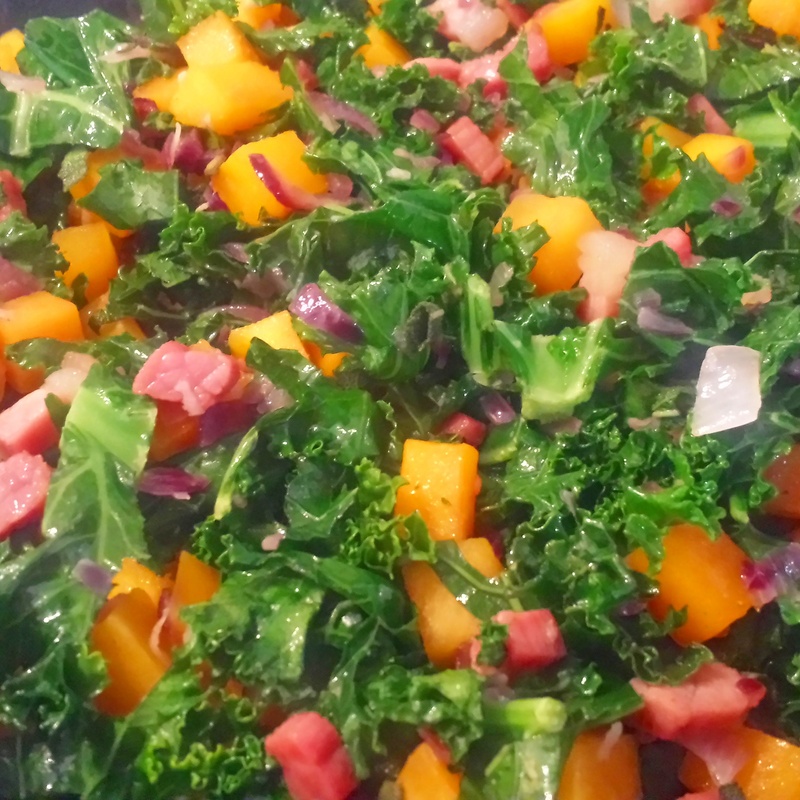 Add in the shredded kale, sage and cooked pancetta and cover the pan with a lid or foil. Cook down until the butternut squash is tender and the kale is steamed. 2. Meanwhile, you can make the white sauce. Take a medium pan and melt the butter and flour together over a medium heat. Mix together the cream and milk and gradually add to the pan; don’t rush it! If lumps appear, simply take the pan off the heat and whisk it until they disappear and continue on. When the sauce has thickened, take the pan off the heat, season and add half of the parmesan (the rest will be used as a topping for the gnocchi bake). 3. When the squash and kale mix and sauce is ready, take a large roasting dish and place the gnocchi in the bottom. Add the white sauce of the vegetables and make sure each piece is well coated before tossing through the gnocchi. Sprinkle the remaining parmesan over the top and a drizzle of oil and bake for half an hour or until golden. I covered the dish with foil for the first half of cooking and then removed it to finish it off. Serve is warmed bowls and dig in! Traditionally panzanella is a Tuscan salad consisting of an abundance of tomatoes and croutons however I have given it a vegetable twist! I have used elements of the traditional method and balanced a selection of root vegetables and herbs to give a fresh finish. Although the addition of feta is not exactly in keeping with the original, I think it adds a sharpness which enhances the sweetness of the vegetables. 1. Start off by making sure all the veegtables are prepped and ready to go! Preheat the oven to 190c/ 160 fan. Take the beetroot wedges and place them in a baking tray, toss in a light coating of olive oil and season. I used smoked salt instead of normal salt as this is my latest fascination but normal is fine. Cook for around 20 minutes. 2. After the beetroot have been started off place the rest of the vegetables in a larger baking tray, mix together all the dressing ingredients and toss. Add in a good helping of fresh thyme springs and nestle the whole (not peeled) garlic cloves in amongst. Roast for around another 20-25 minutes until all the vegetables are tender. When they are ready I fished out the garlic and squeezed it from it papery coating before mixing it through the vegetables to add an extra layer of flavour. 3. While the vegetables are cooking away you can cut the bread into chunks and place of a baking sheet with a light drizzle of olive oil. In the last 5 minutes of the vegetables cooking, place onto the bottom shelf of the oven to crisp and go golden, turning half way. I finished my panzanella with a few sage leaves so this can also be prepared now; simply wash the leaves and pat dry with kitchen towel. Heat a small amount of oil in a small frynig pan and fry the leaves in batches. I used relatively large leaves which took around 30 seconds each side but watch to make sure they don’t burn or discolour. I held the leaves flat in the pan with a fork too. When fried, remove and blot onto kitchen towel. 4. Toss the croutons through the tender, sweet vegetables and pile onto a large serving plate. Finish off by sprinkling little chunks of feta over and adding the crispy sage leaves in top. 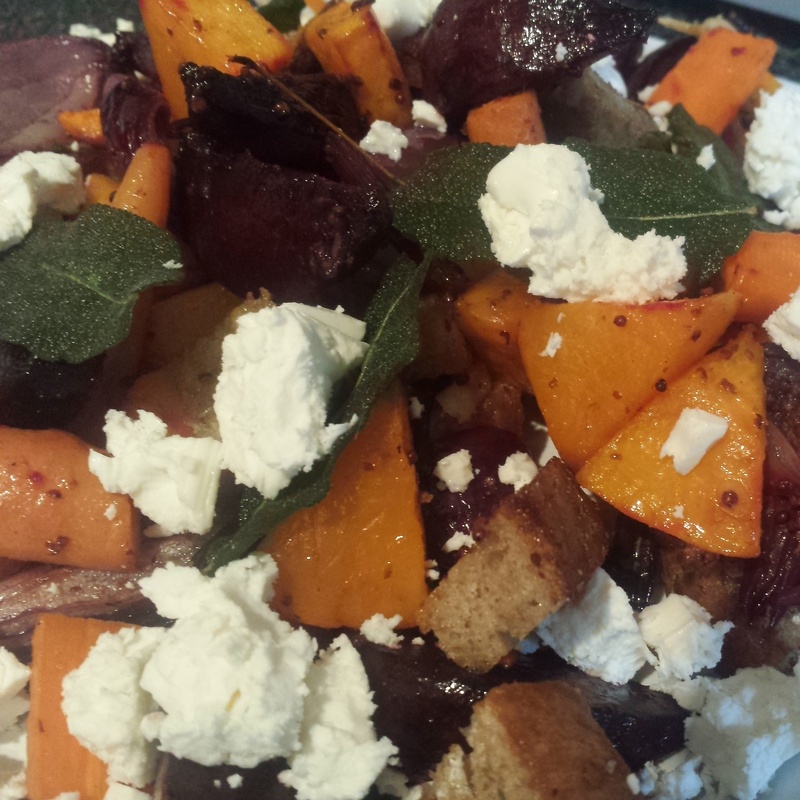 Roasted root vegetable and feta panzanella with crispy sage- fresh, vibrant and oh so delicious! 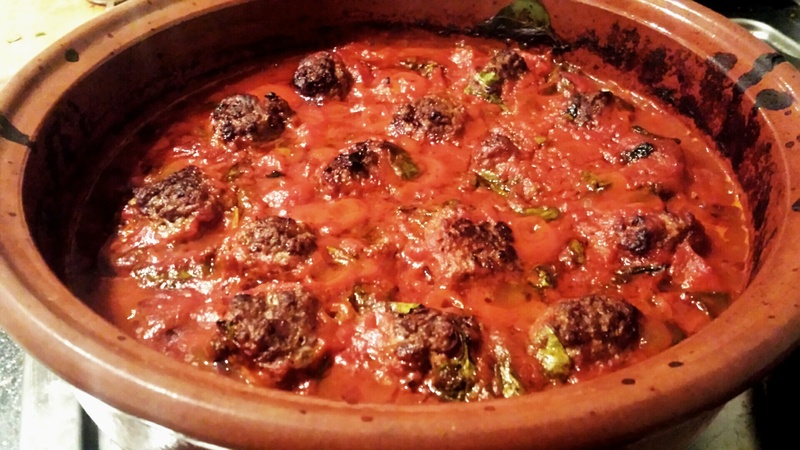 You just can’t beat a hearty helping of meatballs so read on for a Middle Eastern twist! The meatballs should be gently spiced and you should be able to taste each spice so don’t be tempted to go crazy! Any leftovers (if there are any!) are perfect reheated and served in a pitta bread with salad and yogurt sauce. I used a normal harissa in the tomato sauce however if you prefer less of a kick then rose harissa can be substituted which is sweeter. 1. Get going by combining all the meatball ingredients. I don’t use egg or breadcrumb to bind it all as, if you work on the mince enough, the balls should hold together anyway. Squidge the mince around in a bowl before shaping into balls which should be about the size of a golf ball. Place on a baking sheet and pop in the fridge to chill for around half an hour. 2. Meanwhile, preheat the oven to 180c/160fan. Take a large, wide based pan (or tagine if you have one) and heat a splash of oil over a medium heat in your pan of choice. Gently fry off the onion and garlic for a couple of minutes before adding the harissa, tomatoes and stock and stir well. Pop the red peppers in at this stage if you are using them. Lower to a simmer whilst you grab a frying pan and brown off the meatballs. You need the meat to brown on all sides and you may need to do this in batches- don’t overcrowd the pan! When they are browned and the sauce has started off, simply drop the balls into the sauce and bring back up to a simmer. 3. Cover the meatball pan and cook in the oven for 45 minutes until the sauce is reduced and the meatballs are cooked through. Jiggle the meatballs in the pan from time to time! I like to also stir through some spinach towards the end of cooking to add a little something (and spinach is also a love of mine so any excuse!). Serve with warmed bread or cous cous and enjoy! A spoonful of a cooling yogurt and mint sauce is also delicious too!